Republished from Avenza (1, 2, 3). 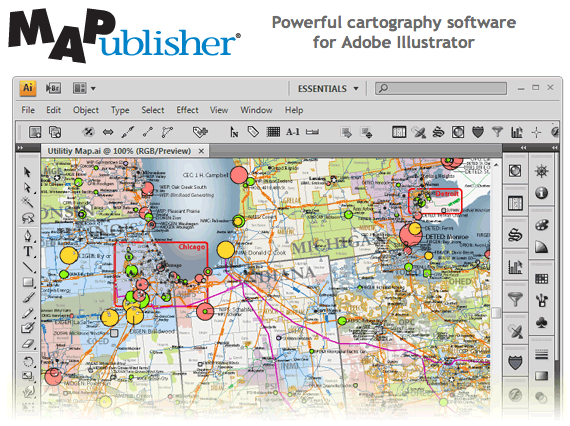 Avenza Systems Inc., producers of MAPublisher cartographic software for Adobe Illustrator and Geographic Imager spatial tools for Adobe Photoshop is pleased to announce the release of MAPublisher 8.2 for Adobe Illustrator. MAPublisher 8.2 is the latest version of this powerful mapmaking software used to produce high quality maps from GIS data for both print and electronic distribution and now offers support for both creating geospatial PDF files from within Adobe Creative Suite and importing GIS map data directly from ESRI geodatabases. This entry was posted on Wednesday, November 25th, 2009 at 7:00 am	and is filed under Geography, Google Earth, Google Map Mashup, Interactive, Mapping, Software. You can follow any responses to this entry through the RSS 2.0 feed. Both comments and pings are currently closed.